July 18, 2002 — When I stepped out of my air-conditioned car, the heat hit me like a right hook. The sun was searing and inescapable. Everything, everyone seemed to be surrounded by an abstract haze, kind of like the watercolor paintings that rise from hot highways in the summertime. I was standing in a crowded parking lot in East Dublin, Ga., which is east of Dublin, Ga., west of nowhere and, for the past seven years, home to the annual Redneck Games (imagine the Olympics for people in overalls). 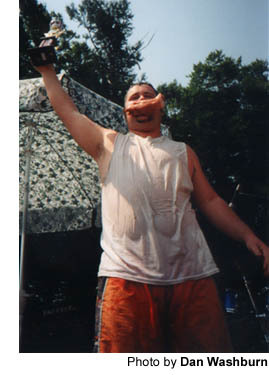 Events include the seed-spitting contest, the hubcap toss, redneck horseshoes (in reality, toilet seats), the armpit serenade, bobbing for pig’s feet and, my specialty, the mud-pit bellyflop. I left my Toyota Corolla with Pennsylvania plates and trudged through the maze of American-made trucks. Sweat began to stain my T-shirt immediately. It was 103 degrees. I felt like I was walking inside someone’s mouth, and that someone was getting ready to spit. I rubbed the back of my neck. I could feel it getting redder by the minute. 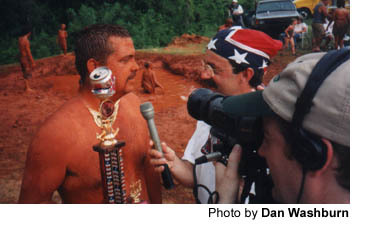 The Redneck Games started as a gag in 1996 when those other Olympics were held two hours north in Atlanta. Five-hundred people showed up for the first one. In 2001, the crowd was estimated at more than 15,000. And on July 6, despite the heat, even more people — some 20,000 or so — packed Buckeye Park along the banks of the Oconee River (the river is where most of the attendees eventually ended up). “So what exactly is a redneck?” I asked. I would repeat that question several times throughout the afternoon. “It’s just somebody who likes to get out and have a beer or two in the sun by the river and just have a good time and relax,” Blue responded. Most on hand at Buckeye Park not only admitted it, they celebrated it. They proudly displayed their redneck pride to … well, all the other rednecks at the games. Confederate flags flew everywhere. Booths sold bumper stickers emblazoned with slogans like, “Never Apologize for Being White.” One woman, who had to be close to full-term in her pregnancy, painted “Future Redneck” on her bare belly. 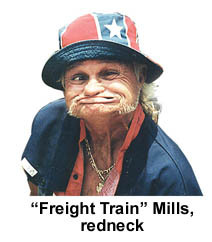 “A redneck is a hard-working person,” said Randy (“everybody calls me ‘L-Bow the Gin-U-Wine Redneck'”) Tidwell. Over the years, the 41-year-old from East Dublin has been adopted as the Redneck Games’ official mascot. Tidwell, who drives a wrecker for a living, kicked off the festivities by running in the official Redneck Games torch — propane, of course — and lighting the ceremonial barbecue pit. Later, he ran the torch down a hill to signify the start of the evening’s fireworks display. Tidwell wore nothing but a pair of overalls and a floppy fishing hat. No shirt. No shoes. He said it was the same outfit he wears every day. By the middle of the afternoon, Tidwell’s neck and shoulders were glowing, some shade beyond red. He was scarlet. Rednecks, he told me, don’t believe in sunscreen. But they like fun and games. And they take the two seriously. After winning the hubcap toss, 24-year-old Eric Outler of Vidalia, Ga., thanked God and the late Dale Earnhardt for his victory. 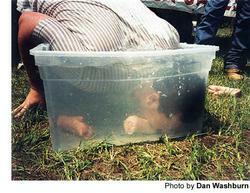 Without a doubt, the events that attract the most attention are bobbing for pig’s feet and the mud-pit belly flop. Ashley Richardson, a 19-year-old from Milledgeville, Ga., won the pig’s feet competition for the third year in a row. This year, he set a new world record: seven feet in 19 seconds. Afterward, he posed for photos with a pig’s foot in his mouth. Back in 1999, MTV sent some of its “Real World” and “Road Rules” participants down to East Dublin for a Redneck Games throw-down. But many of the pseudo-stars threw up instead. Twenty-six-year-old Ron Johnson of East Dublin won his third straight bellyflop title this year, no doubt due to his home-mud-pit advantage. But by the time the last Budweiser had been drunk that day, nearly everyone had taken a dip in the dirty drink. It was cool in there. It’s not lotion, but a nice thick coating of Georgia red clay blocks those harmful UV rays quite nicely. Even the “Redneck Nanny” Barbara Braswyl — so named because the 47-year-old has (yikes!) 12 grandchildren — took the plunge, soiling her homemade American flag dress in the process. 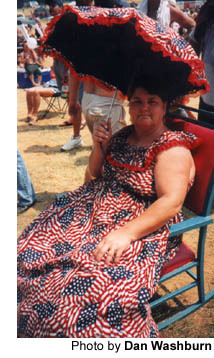 No worries, Braswyl makes a new dress for every Redneck Games. “I’m going to do a John Deere one next year,” the Wrightsville, Ga., resident said. 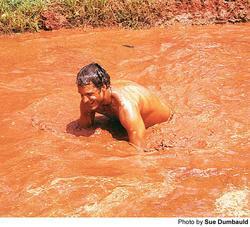 First into the mud pit? Who else? I gave my best Yankee, er, Rebel yell and let my flop fly. When I cleared the mud from my eyes, L-Bow gave me a thumbs-up. I had the official redneck seal of approval. Five hours later, I was still picking mud from my pockets.